If your daughter will be participating in the Horseback Riding activities, please send along 2 extra wide skirts and 2 pairs of leggings. **At least one modest swimwear is preferable for lake swimming. To maintain the high moral and ethical standards of Jewish tradition, all campers are to be dressed modestly. During the school year the home and the school play a most vital role in the chinuch of our daughters. During the summer, sleep-away camp must take the place of both the home as well as the school. 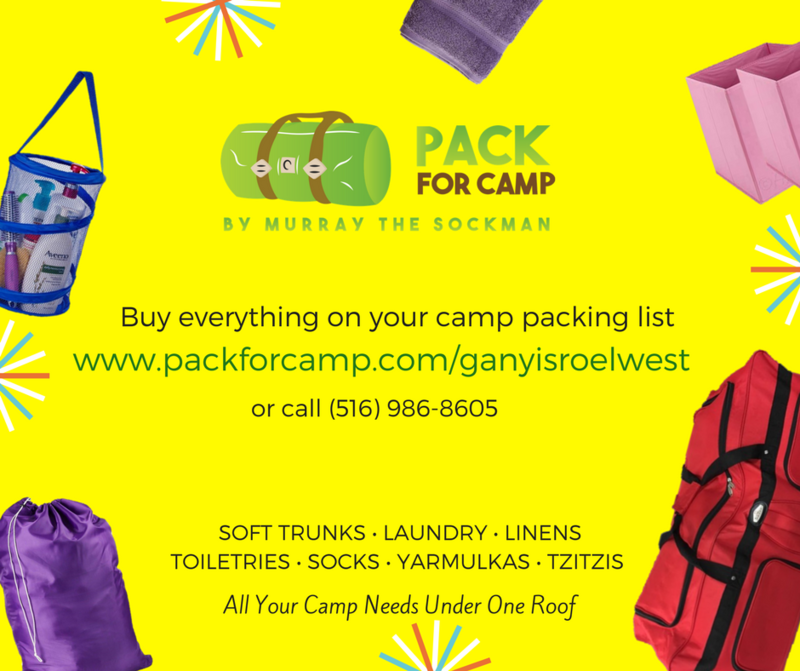 Gan Yisroel West expects a high standard of tznius of every camper. Every camper and staff member is asked to review the following carefully. (1) Proper, dignified Shabbos clothing and footwear truly enhances our Shabbosim. It is of paramount importance that the clothing your child wears for Shabbos clearly identifies with the beauty and kedusha of Shabbos. Shabbos attire may NOT include T-Shirts, Denim skirts or tightly fitted sweaters and no robes will be allowed on Shabbos in the dining room. (2) Shirts must have sleeves that do not ride up and are generously covering the elbow. Shirts must cover necklines properly and cannot be tight-fitting, or have any secular slogans or pictures. (3) Skirts must generously cover the knee when sitting AND standing even while wearing tights. Skirts with slits must conform to the same rules. Wraparound or button-down skirts with an open flap must be sewn down. (4) Necklines must cover the collarbone. (5) Only tights or knee-length socks that are long enough to cover the gap between the skirt and sock are allowed. Leggings are allowed for horseback riding but must be worn with socks that completely cover the gap between the bottom of the leggings and the sock. (6) Nightgowns are the proper nightwear at Gan Yisroel West. Long sleeve tops with pajama pants may only be worn with a skirt or robe on top, and only in the bunkhouse. SHORTS and SLEEVELESS tops may not be worn. (7) Make-up is not permitted for campers. Only light colored nail polish is allowed. (8) Tee shirts with inappropriate slogans are not acceptable. (9) No two-piece bathing suits. While walking to and from the lake, the laws of Tznius apply as well. All robes should properly close and socks must be worn.